This past Monday I mentioned in my post that Gavin had been breaking out in a rash. We were kinda confused by it. I thought about some of the new foods I had introduced. There was the black eyed peas with onions and tomatoes....the mushrooms and onions in his veggie stew...the orange Champion greek yogurt...they were the only "new things." Tonight, I took Gavin to see my Acupuncturist, Dr. Kang. I told her about the new foods - and the other things he has been eating. In the end, he showed a reaction to PINEAPPLE! Our last batch of chickens that we pureed had fresh pineapple in there. He has had it before - Pineapple Chicken - but neither of us remember him having a reaction. But he sure reacted tonight! So we promptly threw out our freezer stash of Pineapple Chicken and ran out to get more chicken to puree. Gavin LOVES chicken. I feel so grateful to be able to turn to alternative medicine like I do. 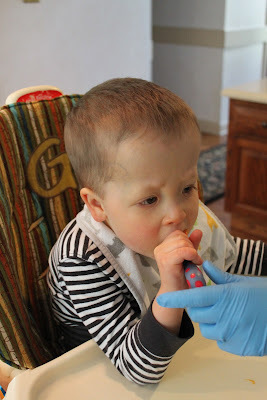 I might have waited weeks or a month or more to get him tested at an allergist - and it would have been the needle pricks. This was SO much easier. 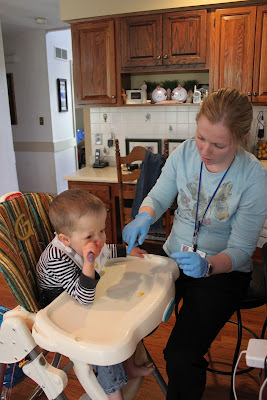 Today he had Occupational Therapy with Miss Stephanie. And yesterday he had feeding therapy with Miss Maggie. Both therapists work with him on his feeding issues. Maggie is more interested in what he does in his mouth - chewing, moving food around, closing his mouth, etc. Stephanie is more interested in the practicality of eating - getting him to feed himself. As for Gavin, he's more interested in whatever he's interested in. As usual, his performance in therapy depends on his mood at that moment. Translation: Not interested in the Cinnamon Applesauce on that spoon. She tried several times while I was singing and dancing in the background to keep him from swatting the spoon out of her hand. 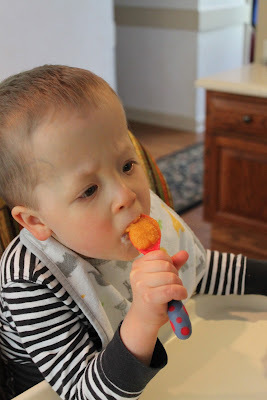 But then we switched the food to Yams - one of Gavin's all time favorite foods. My idle threats, claiming that if I didn't get "Money Shots" for this blog that he'd be out of the will - they fell on deaf ears. Put some Yams on a spoon? Suddenly he's a regular performance artist. Gavin knows what he likes. I guess you gotta hand it to him for sticking up for himself.